LAS VEGAS – Before he was old enough to smile, Rob Matthews was quickly moving into life in the world of rodeo. He was 1 month old when his parents took him to the West of the Pecos (Texas) Rodeo, just down the street from his home. He’s been part of the sport ever since, from riding and roping to telling stories about the sport on the Pro Rodeo Roundup, a weekday radio feature that has been picked up by 50 affiliates in 10 states across the country. Rob Matthews, right, receives the Professional Rodeo Cowboys Association’s Media Award for Excellence in Broadcast Journalism on Wednesday night in Las Vegas. 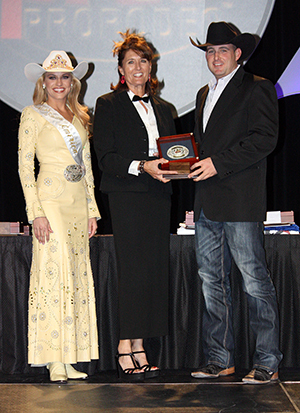 Here Matthews poses with Miss Rodeo America Chenae Shiner, left, and Kendra Santos, the PRCA’s director of communications. Matthews was awarded for his lifetime of work in the sport by earning the Professional Rodeo Cowboys Association’s Media Award for Excellence in Broadcast Journalism during the organization’s annual awards banquet in Las Vegas. The ceremony took place in conjunction with the Wrangler National Finals Rodeo, the sport’s grand finale. The list of past winners includes world champion cowboys/rodeo analysts like Joe Beaver and Don Gay; ProRodeo Announcer of the Year Hadley Barrett; and television commentators Jeff Medders and Butch Knowles, who continue to call the action from various rodeos, including the NFR. Sponsored by Cowboy Up Energy Drink, Pro Fantasy Rodeo and Capital Hatters, the Pro Rodeo Roundup is a daily 3-minute program that includes tidbits of timely information on the sport, including interviews from the top names in the sport. What makes Pro Rodeo Roundup successful? The format works well for stations and fans, and the stories are poignant and timely. “I try to make the program more about the cowboys and cowgirls telling the story than me telling it for them,” he said. “The fans want to hear the cowboys and cowgirls tell the story. I try to feature comments from two contestants per show. I produce and present the show, but it’s the cowboys and cowgirls that make it what it is. So has Matthews, which is why he’ll have a buckle recognizing him for his outstanding work.